Like most of the rest of the world, we’ve discovered that we love Groupon deals. Everyday, Groupon emails its customers with coupons (Groupons, rather) tailored to each city. Restaurants, salons, services… almost anything you can think of. Some days, the deals are easy to pass by, and other days, they’re impossible to refuse. As you can imagine, the food Groupons are the ones that we find particularly difficult to say no to. So, when they emailed us with a Groupon to a fish market, we jumped on it. Without doing much research, we figured that it would be a typical seafood market- scallops, grouper, shrimp, halibut, tuna… all the things we’re used to finding. When we got there, however, we found that it didn’t have ANYTHING that we were used to! It was mostly fresh water fish, with the exception of tilapia. So, we decided to be adventurous, and we got a pound each of lake trout, catfish, and croaker. We’ve tried them all and are happy to report that each is absolutely delicious! There’s a good frugal lesson that we learned from this trip as well- these fresh water fish were all less than $5 per pound. So, with a 15 dollar Groupon, we walked away with over 3 pounds of fish! That’s a great deal. 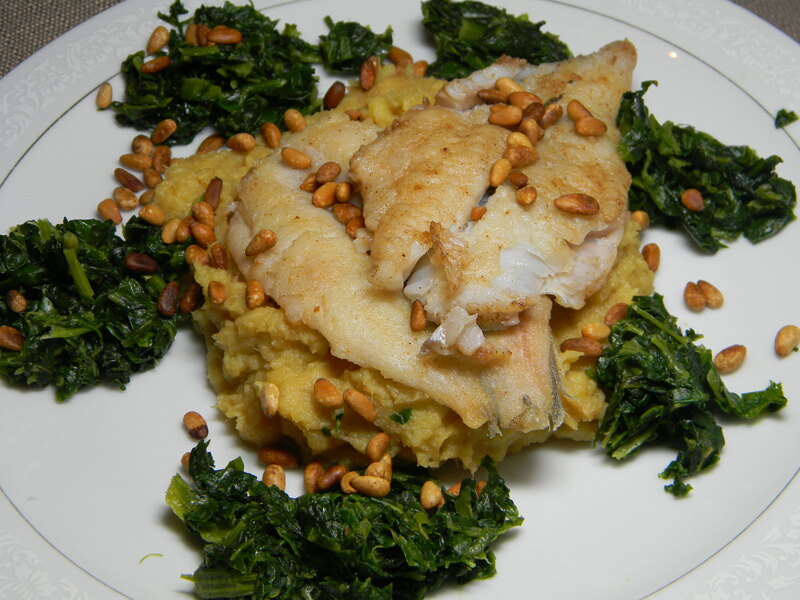 We pan fried the trout and served it with an apple and white sweet potato mash, with spinach and pine nuts on the side- it was a delicious meal. Just for the fun of it, we’re posting both the mashed white sweet potato recipe and the trout recipe today- hope you enjoy them! I just looked at this and thought, “mmm, that looks good. oh wait! I ate that with them!” Lucky me! The combo of sweet and savory is always welcomed in our home. I love to find new ways to cook fish.